Shadao Gully ​- offering a tranquil hiking trail in Wulingyuan! Set in Zhangjiajie National Forest Park, Shadao Gully is home to old trees and vines with strange stones and peaks around. It is a "u"-shaped deep valley, and the east of the gully stand Qianli Xianghui Peaks by Golden Whip Stream and the west is Purple Grass Pond by Golden Whip Stream as well. Who visits: Photographers, Hikers, Adventure enthusiasts! Shadao Gully is off-the-beaten track just like Yaozizhai Mountain. Therefore, green moss is covered with the stone steps in the gully. Hundreds of peaks in different shapes tower into the sky. In winter, they look like jade bamboo shoots or silver towers with the snow. If visitors hike in the gully, they will be shocked at the power of the nature. If you visit the gully from Qianli Xianghui and hike along the gully in counter-clockwise direction, the Back Garden with different strange peaks, Mihun Stage, Tian Xia Di Yi Qiao Tianxun Bailian Waterfall and other stunning spots. Mihun Stage features breathtaking views. Turn left from Purple Grass Pond, walk through Golden Whip Stream, go upstream and then you will enter Shadao Gully. If you are planning to visit Shadao Gully for photography purposes, you can visit it around the year as it presents different stunning views in 4 seasons. Generally speaking, it is recommended that you visit it in April, May, September and October for the four months are not too hot or too cold. Visitors can walk through Golden Whip Stream and turn left from Purple Grass Pond. Therefore, visitors shall know how to get to Golden Whip Stream. After entering the National Forest Park Ticket Station, visitors walk ahead for 300 meters. They will see the entrance to Golden Whip Stream. There are several options on how to get to National Forest Park Ticket Station. Rent a car from Zhangjiajie airport, Zhangjiajie Train Station or Zhangjiajie Bus Station to the National Forest Ticket Station. This is the quickest and most direct option. Take a flight to Zhangjiajie airport from Guilin, Beijing, Chengdu, Wuhan, Xi’an and other cities. Then, rent a car to Zhangjiejie Train Station to take the shuttle bus. It takes 40 minutes drive from the station to National Forest Park Ticket Station. Alternatively, rent a car to the ticket station. Take a train to Zhangjiajie train station from Guangzhou, Nanning, Shenzhen, Wuchang and other cities. Then, walk to the Zhangjiajie Bus Station to take the tourists bus. It takes 40 minutes drive from the station to National Forest Park Ticket Station. Alternatively, rent a car to the ticket station. 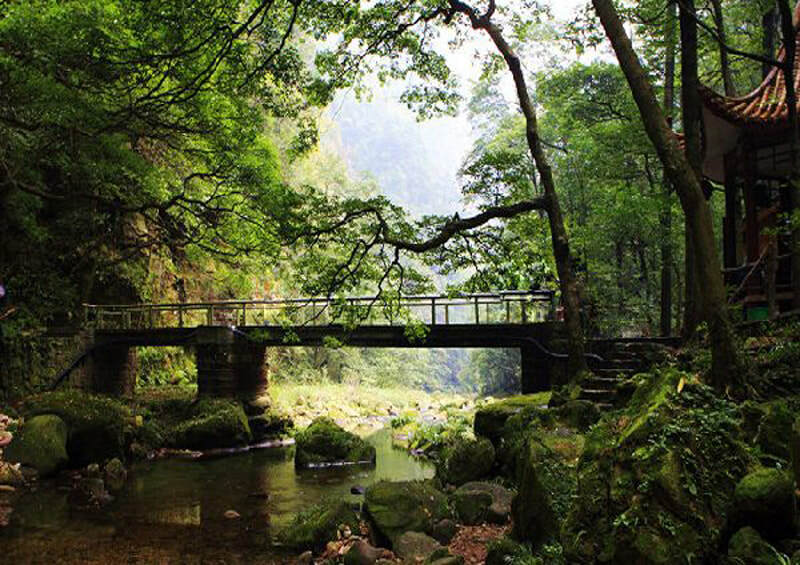 As Shadao Gully is located in Zhangjiajie National Forest Park which is part of Wulingyuan Scenic Area, visitors can enter the the park from National Forest Park Ticket Station with the pass ticket for Wulingyuan Scenic Area. The pass ticket is valid in four days from the date when you get it ( For example, if the ticket is issued at 13:00 on Monday 9th July, 2018, the ticket is valid by 13:00 on Friday 13th July, 2018). You could take a complimentary eco-friendly car with the pass ticket. With the pass ticket, you can visit all the four scenic areas mentioned above and can enter the Wulingyuan from one of five entrances at the five ticket stations. As at 11th July 2018, admission fee which is applied between December 1st and February 28th/29th is as follows. Admission fee to Wulingyuan Area is 126 CNY per adult (including the insurance). Notes: The area can be closed because of the snow in winter. Be sure not to explore Shadao Gully by yourself as the trail is covered with green moss. If you don’t pay attention to the trail for a second, it is possible for you to fall down. In case of emergency, your partners can help you out. It is recommended that you take an umbrella with you when visiting the Wulingyuan Scenic Area in Zhangjiajie. If you plan to visit the area in summer, you’d better take the sunscreen, floral water, sunglasses, band-aid and hats. Please remember to wear antiskid hiking shoes. During the National Day Festival of China, Spring Festival and the summer holiday, pricing for hotels and restaurants also goes up as they are the peak season in China. The ticket offices of most scenic spots offer luggage storage service. Be sure not to explore the areas marked with "No Passing" and "Dangerous" . The mountain road is wet and slippery in rainy days. In addition, rain and fog can also lead to unclear sight. Thus, it is not suggested that you risk climbing the mountain in the rain. Interested in hiking the Shadao Gully on a Tour? Wendy Wei Tours offers a variety of different packaged tours as well as custom tours including the Shadao Gully, among other attractions and destinations. To find out more, please visit our Tours page or Contact Us directly to find out more.